Apple has released a new update for the second generation Apple TV. Apple TV Software Update 4.3 adds support for Vimeo and purchasing TV shows. 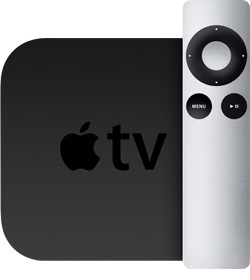 â€¢ TV show purchases: Purchase TV shows on Apple TV. Shows purchased on Apple TV can be re-downloaded on other iOS devices. Shows purchased on other iOS devices or with iTunes automatically show up as available to play on Apple TV. Re-downloading is US only. â€¢ Vimeo: Browse and watch millions of user-uploaded videos found on the Vimeo service, for free. To install the update on your Apple TV go to Settings then General then Update Software then Download and Install. Where can i get apple tv in jeddah?